The Bear Garden Elizabethan Amphitheatre served as both a theatre and a blood sports arena for bear-baiting and bull-baiting. It was located on the Bankside in Southwark on the south side of the Thames. Opposite the City Of London, where the Swan , Hope, Bull Ring and Globe Theatre had also been situated. The Bear Garden was originally built as a blood sport arena. Bear and Bull baiting were major spectator sports and there were several purpose-built arenas in this area specifically designed to house these events. Bear baiting had been introduced to England during the Medieval period of the 1200's - nearly every town in Elizabethan England boasted a Bull and Bear baiting ring. Seen as a great sporting and gambling event Bull and Bear baiting was patronised by all classes of Elizabethans including the Queen, courtiers and foreign ambassadors. Queen Elizabeth I even had a Bear baiting arena built in the grounds of Whitehall. Vast amounts of money were waged on the outcome of the contests. 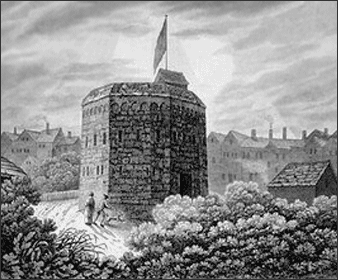 The Elizabethan theatrical entrepreneurs, Philip Henslowe and Jacob Meade demolished the original Bear Garden which dated back to the 1560's and built the Hope theatre on the same site (but slightly further South) in 1613-14, the Hope featured both blood sports and theatre but evolved into a Bear baiting arena only, and popularly became known as the Beargarden rather than the Hope theatre. Theatrical Performances proved to be so popular that in 1591 the growing popularity of theatres led to a law closing all theaters on Thursdays so that the bull and bear baiting industries would not be neglected. Bear baiting were immensely popular during the Elizabethan era and this bloodthirsty entertainment consisted of trained bulldogs or mastiffs attacking tethered bears. Bear baiting at the Bear Garden would be conducted according to the following information. The bear, with a chain attached to a collar around its neck, would be fastened to a stake with an iron ring in it, situated in the centre of the ring. A group of dogs were then set on the bear. The dogs tried to kill the bear by biting its throat. The chain was about 15 feet long, so that the animal was confined to a space of 30 feet diameter. The owners of the dogs stood round this circle, each holding their dog by its ears, and when the sport began, the dogs would be let loose. The bear was baited for about an hour. Bull-Baiting and Bear-Baiting was extremely similar, except that Bull-Baiting was more common in England due to the scarcity and cost of bears. The scarcity of bears was addressed by large consignments of these animals being imported from abroad and kept in enclosed fields until they were required. Bulls, bears and dogs were trained specifically for such blood sports. In 1648 the theatres in London were closed by the Puritans. 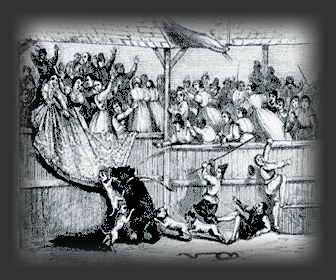 Ironically Bull-Baiting and Bear-Baiting was allowed to continue and this form of entertainment was popular throughout the Puritan era. Old maps of London clearly show the architecture of the buildings, and these have enabled an approximate picture of the Bear Garden, such as the example pictured at the top of this page, to be drawn. The picture below of the map by Claes Van Visscher clearly shows the architecture and location of the old Globe Theatre and its close proximity to the Bear Garden pre 1613 ( replaced by the Hope Theatre in 1613/1614). A single red brick house set among warehouses and offices down a narrow side street marks the site of the last bearbaiting ring on Bankside. The house on the Bear Gardens site is now the Globe Education Centre, part of the New Globe Theatre complex. The New Globe Theatre Educational Centre specialises in organising workshops for student groups from schools and universities. It also hosts staged readings, lectures and seminar groups. The areas colourful history has not been forgotten - in the foyer of the Educational Centre is a large stuffed black bear!